Annually, "The Builder" (a trade journal), awards a prize to a student of the Bartlett School of Architecture, University College London for the preparation and presentation of measured drawings. In 1965 Mr. J. C. Harboard took the prize for his August 1964 survey of ex-WD 75034 (Robert Stephenson & Hawthorne 7173 of 1944) at Westhorpe Colliery, Derbyshire. We are indebted to Mr. Harboard, and to Mr. I. M. Leslie (Editor of "Building", formerly "The Builder") for permission to reproduce these drawings which originally appeared in the "Builder" issue dated 11th June 1965 - Hon. Eds. With the virtual annihilation by British Railways of such monumental classes as the 57XX panniers and the Black Fives, and indeed the whole of the main line steam stock, the average locomotive enthusiast may be forgiven for thinking that the remaining steam locomotives in industrial use are a motley collection of antique midgets. However, the student of industrial railways has the advantage of knowing that, notwithstanding the long shadows of multitudinous 4F’s and 8F’s, one of this country’s largest classes of locomotives, numbering almost 500 strong, was the product of a private company. Not only was it a large class numerically but also physically; for at the time of their inception these saddle tank locomotives were the biggest in "private" use. Unlike many industrial locomotives their construction was announced publicly, but the wartime cloak of secrecy did not reveal any details. 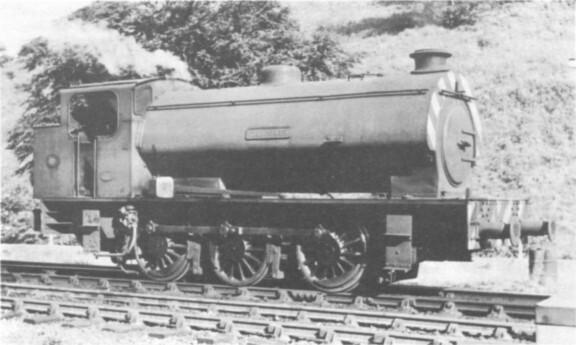 In September 1943 the "Railway Magazine" announced that the "Ministry of Supply has recently placed orders with locomotive manufacturing firms in this country for a number of 0-6-0 saddle tank engines to a simple and robust design based by the Ministry on a standard shunter of a well known locomotive building firm". This well known firm was the Hunslet Engine Co. Ltd., of Leeds, established in 1854, and the standard shunter was their 18in by 26in cylinder "50550" class. Externally the "new" locomotive was almost identical to the earlier ones, with the exception of the cab and bunker outline. Cab roofs at the eaves were now radiused and bunkers were extended beyond the rear buffer beam, having a vertical end as opposed to the former sloping back; this gave a 5 cwt increase in coal capacity. There were other differences not readily discernible, the majority being internal changes in construction. Driving wheels were now 4ft 3in diameter as against 4ft 0½in and had cast iron centres; steel boiler tubes were substituted for brass, and phosphor bronze replaced the white metal for the coupling rod bushes. The locomotive scaled almost 2 tons more than the original but the tractive effort decreased from 26280 lbs to 23870 lbs, the boiler pressure remaining the same at 170lbs per sq. in. Steam brakes were fitted to all wheels and could be operated from either side of the cab. Valve gear was Stephenson link motion and slide valves were fitted to the 18in by 26in cylinders. It is unfortunate that the word "Austerity" was applied to them, but at the time this was the "with-it" way of describing almost anything adapted to the stringent wartime simplification of production. Their illustrious record proves that even the pruning of the original super-quality specification did no harm. It was as far back as 1937 that the first 18in Hunslet (works number 1849) was built for Guest Keen Baldwins Iron & Steel Co Ltd who required something more powerful than the existing types of steelworks locomotives. Hunslet’s "48150" class was the logical development of the 1923 design inside cylinder saddle tank which had 16in x 22in cylinders, 3ft 9in wheels and 160 lbs/sq in boiler pressure, examples of which were still being built in the late 1950’s. 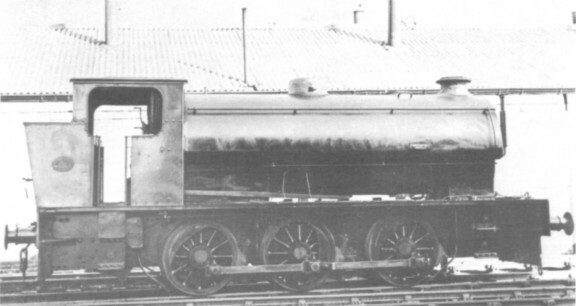 The "48150" class had 18in x 26in cylinders, 4ft 0½in wheels and 170 lbs/sq. in. boiler pressure giving a tractive effort of 26280 lbs; the short saddle tank, similar to that on the 16in engines was retained but had a closed dome. From the outset the 18in type was a great success and nine were built up to 1942 by which time the improved "50550" class engines had appeared. Subsequently another seven were built including two as late as 1953. The main difference between the "50550" class of 1941 compared with the "48150" class was the provision of an enlarged saddle tank, extended to the limit of the smokebox, through which the petticoat pipe passed to the greatly reduced chimney above. An impressive if somewhat top heavy looking machine resulted. Once again a steel company had been responsible for requesting a special design for specific work. Stewarts & Lloyds Ltd planned a quarry development scheme at Islip with a connecting line to Corby steelworks but by the time the locomotives were built the project had been abandoned. Three of the eight locomotives built in 1941 and 1942 were taken over by the War Department, thus becoming the true forerunners of the "WD Austerity" type. Of the others one went to Stewarts & Lloyds Ltd, one to the Parkgate Iron & Steel Co. Ltd and three to the Stanton Ironworks Co Ltd.
By 1942 it was realised that the success of the forthcoming military operations in Europe, following the secretly planned invasion of France, would rely upon efficient transport arrangements for many thousands of tons of supplies. Locomotive production, which until this time had been restricted, was now a priority item and all that remained was to select the most suitable types for the jobs in hand. 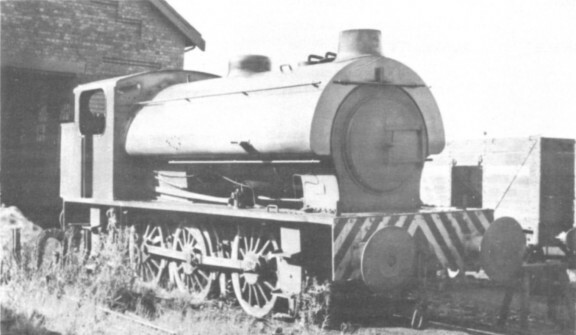 At a Ministry of Supply conference it was suggested that for the heavy shunting locomotive the LSMR "Jinty" would be the best prototype but Edgar Alcock, the Hunslet Chairman, convinced the Ministry that the Hunslet 18in saddle tank, being of a more straight-forward design and of shorter wheelbase, would be more suitable both from the production viewpoint and for greater route availability. One of the conditions was that the locomotives should be capable of performing at least two years intensive hard work irrespective of the state of the track on which they were to operate. In addition they were to be capable of starting a 1,000-1,100 ton train on the level, 550 tons up 1 in 100 and 300 tons up 1 in 50 grades. When one sees one of these fine machines at work with a bark almost as loud as a "9F" these capabilities are fully evident. The 1st January 1943 saw the first of the "Austerities" (works number 2849) in steam at Hunslet followed by another 149 over a period of three years; but not all of these came from Hunslet’s works. Other manufacturers commenced building identical machines to Hunslet’s drawings and one was able to see examples bearing the works plates of Andrew Barclay, W. G. Bagnall, Hudswell Clarke, Robert Stephenson & Hawthorns, Vulcan Foundry and the Yorkshire Engine Company. However, those by the last named were not built until 1954 and, to quote Hunslet, "they could have been built to "Austerity" drawings but we have no confirmation on this point". Certainly they are externally identical, although they have a different type of wheel centre and oval buffers. In later years detail differences could be noticed on various locomotives - for example the addition of an extra pair of footplate steps; the fitting of electric lighting equipment; the cut in round top cab on locomotives working from Philadelphia National Coal Board shed in County Durham: and the installation of "walkie-talkie" radios with their associated aerials swaying high above the cab. Chimneys will be mentioned later. The War Department loaned out one of two temporarily to the LMSR, which classified them, rather unfairly perhaps, "3F" and others went to the Ministry of Fuel & Power. The initial livery (Hunslet 2849 to 2893, Hudswell Clarke 1737 to 1741 and 1744 to 175b) was Khaki with 2in yellow figures, WD numbering commencing at 5000. The remainder were turned out in dark green with 6in numerals, while to distinguish them from main line locomotives in whose company they often found themselves 70,000 was added to their running numbers. These arriving at Longmoor in 1943 at first gave trouble with hot boxes but this was soon cured by slight modifications. The locomotives allocated to Longmoor and to the Shropshire & Montgomeryshire Railway (operated by the WD) were fitted with vacuum ejectors and train pipes for working passenger stock while others were fitted with Westinghouse brake pumps. Longmoor even fitted one, experimentally, for oil burning. They were soon at work in Army depots and other Government establishments throughout the length and breadth of the country. With the cessation of hostilities in 1945 the Austerity saddle tanks found themselves scattered far and wide around Europe, many of them surplus to War Department requirements and as such were eventually put up for sale. Twenty seven of the class were loaned immediately to the Nederlandsche Spoorwegen (Dutch State Railway) who purchased them in 1947 and eleven to the Nederlandsche Staatsmijen (Dutch State Mines), two of which were returned later to the WD, the remaining nine becoming the property of the Staatsmijen. Many of them were stored abroad, never returning to this country and whose fate may never be known; similarly some were sold to industrial or light railways in France but apart from a few their identity and whereabouts are shrouded in mystery. Certainly six are known to have gone to the Chemins de Fer Tunisiens in North Africa and there is no mystery about the seventy-five that the LNER purchased in 1946, becoming their class "J94". Later they were absorbed by British Railways and classified "4F" which was more realistic than the "3F" classification of the LMSR. Of the original three "50550" class engines commandeered by the WD the first to be "demobbed" was Hunslet 2414 which went to loan to the Port of London Authority in 1943 (purchased in 1946 and joined after the war by several Austerity class engines) while the other two joined the original "48150" locos at GKB’s East Moors Works in Cardiff. Several more went to other steel concerns, such as the United Steel Cos. Ltd. and to dock service on the Manchester Ship Canal railway. I have not unearthed details of the exact numbers and locations of WD locomotives in industrial service as a comprehensive history would more than fill an issue of this magazine. 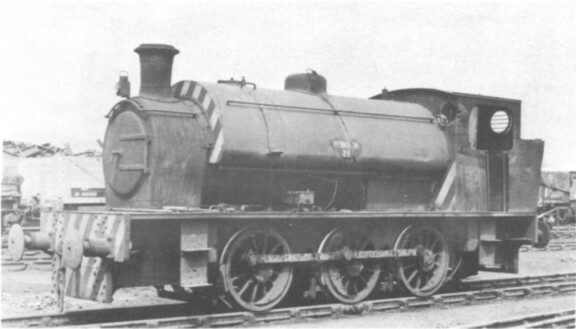 Suffice to say that the largest number of sales were to the National Coal Board which adopted them as their standard shunter at collieries in England, Scotland and Wales, and indeed continued to order new batches until 1964 despite the decision in some areas to replace all steam by diesels. The War Department retained ninety for their own use at depots in this country, renumbering them in the series 100 to 189 and surprisingly enough ordered a further fourteen new examples in 1952. Here again diesels soon became the order of the day, realising further Austerities for NCB service, while the same thing happened on the Port of London Authority and of course on British Railways also. In a minor sort of way the "changes and chances" of Stroudley’s famous "Terriers" being repeated but on a numerically larger scale. Liveries were many and various between the new owners and included black, several shades of red, blue or green, and even yellow. And it is here the story might have ended but in the twilight of the steam era two important developments were given a trial; had they been carried out some ten years earlier the advent of the diesel might have been considerably retarded. One was the Austrian Giesl ejector multiple blast pipe, easily recognised by the grotesque narrowness of the locomotive chimney, which effects a considerable reduction in coal consumption. 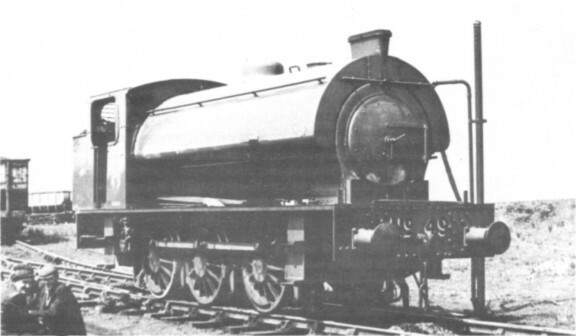 The second was a much more complex affair designed by Hunslet, necessitating major modifications, to overcome the problem of the emission of black smoke outlawed by the Clean Air Act. By fitting an underfeed stoker and replacing the grate by a stoker feed trough and by having new grate sections and a larger brick arch, the unburned gases are consumed before leaving the exhaust stack by way of the Hunslet special blast pipe which is in some ways similar to the Kyala blast pipe at one time fitted to a number of main line locomotives. In some of the earlier conversions the locomotives had air tubes in the sides of the fire-box but these have not been found necessary with the later design of stoker. Again the revealing feature is the appearance of the outer chimney which tapers gently upwards from the wide base. It produces, visually at least, nothing more than a heat haze even when working hard, a rather eerie spectacle considering that the sound effects are in keeping with these of an orthodox locomotives. The first rebuild was Hunslet 2876 in September 1961 and more have followed including some or the locomotives built by other companies to Hunslet design. Some have been rebuilt by the NCB (who have also fitted the Giesl Ejectors) and one is left to speculate, rather pessimistically perhaps in view of the proposed drastic recession in the coal industry, whether any more locomotives will be fitted with these devices. Locomotive enthusiasts are, by and large, a conservative lot allergic to modernisation in all its forms. That the Hunslet "Austerity" locomotive became almost as ubiquitous as Stanier’s "Black Fives" (and sharing with them one of their greatest elements of success - a very free - steaming boiler) and caused the demise of many rare old veterans has led to a certain unwarranted disdain for what, I submit most sincerely, should rank as one of the classic designs in locomotive history. I will not pretend they are as magnificent as Manning Wardles, nor as pretty as Pecketts, yet they are to the steam lover a much more acceptable alternative to growling "boxes". If they should stave off the ultimate extinction of the steam locomotive for even a few short years then they must acclaim the credit they deserve and we should be extremely grateful. In conclusion grateful thanks are due to all who have assisted in the preparation of this article, including R. C. Riley, Eric Tonks, Keith Clingan and not least the Hunslet Engine Co. Ltd whose interest and co-operation has been invaluable. The Leicester Railway Society Review, 1966. CYLS (2, inside) 18" x 26" 18" x 26" 18" x 26"
WHEEL DIAM. 4' - 0½" 4' - 0½" 4' - 3"
WHEELBASE 11' - 0" 11' - 0" 11' - 0"
HEATING SURFACE 960 sq. ft. 970 sq. ft. 960 sq. ft.
GRATE AREA 16.8 sq. ft. 16.8 sq. ft. 16.8 sq. ft.
" " 1873-4 " "
" " 2077 1940 "
" " 2123 " "
" " 2262 1941 "
" " 2376-7 " "
" " 3277 1945 "
" " 3709 1950 "
" " 3710 1951 "
AB Andrew Barclay, Sons & Co. Ltd.
GKB Guest Keen Baldwins Iron & Steel Co. Ltd.
HC Hudswell Clarke & Co. Ltd. HE Hunslet Engine Co. Ltd.
LNER London & North Eastern Rly. PG Park Gate Iron & Steel Co. Ltd.
RSH Robert Stephenson & Hawthorns Ltd.
RTB Richard Thomas & Baldwins Ltd.
S & L Stewarts & Lloyds Ltd.
SIW Stanton Ironworks Co. Ltd.
USC United Steel Companies Ltd.
WB W. G. Bagnall Ltd.
YE Yorkshire Engine Co. Ltd.
8006 - 9 HC 1755/60. HE 3151-8. 8010 - 9 HE 3167/9/74/5/84/90/8/9. WB 2738/41. 8020 - 9 WB 2752. RSH 7133/4/40/63. HC 1775/83. HE 3204/11/5. 8030 - 9 HE 3216. RSH 7202/11. VF 5277/87/5310/1/2/3/4. 8040 - 9 VF 5315/6/7/8/9/20/1. WB 2781/2/3. 8050 - 9 WB 2784/5/6/8/9/90/1/2/3/4. 8060 - 9 HC 1785/6/7/8/9/90/1/2/3/4. 8070 - 9 RSH 7285. AB 2186/7/8/9/90. AB 2211/5/2/3. 8801 - 9 HE 2849/50/61/2/9/74. RSH 7087/90/95. 8810 - 9 RSH 7102. HC 1737/9/44/61. HE 3155/6/73. WB 2743/5. 8820 - 9 WB 2748. HC 1766. HE 2875. RSH 7089. HC 1745. HE 3154/6. 65 - 9 HE 2856. RSH 7110. HE 2858. RSH 7093. HC 1772. 71 - 6 HE 2860/3. HE 3186. HE 2851/2. RSH 7148. Note : HE 2852 and RSH 7148 were on loan only and later returned to WD. RSH 7287/90. WB 2778. VF 5289/90/92. HC 1768/79/80. RSH 7167/203/209. VF 5281. 110 - 9 RSH 7108/11/2/4/5. HC 1759. HE 3201. HC 1763/82. AB 2181. 120 - 9 AB 2182. HE 2894/6/7/8. RSH 7099. HC 1762. HE 3150/2/3. 130 - 9 HE 3157/61/3/4/8/71/2/6/83/92. 140 - 9 HE 3193/5. WB 2739/40/4/50/3/9. RSH 7130/1. 150 - 9 RSH 7136/7/9/41/2/3. HE 3202/7/8/9. 160 - 9 HE 3210/2/3/4. RSH 7286. AB 2183/4/5. HE 2868. WB 2764. 170 - 9 WB 2767/73/4/5/6/7. RSH 7204/5/7/8. 180 - 9 RSH 7210. VF 5272/3/4/5/6/80/2/4/5. 190 - 9 HE 3790 - 9 new construction. HE 3800 - 3 new construction. Note: All the above except 3877/8/9/81/93 are fitted with HUNSLET underfeed stokers and gas producer systems.